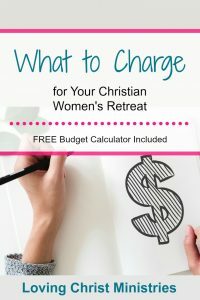 Knowing what to charge for your women’s retreat can be difficult. 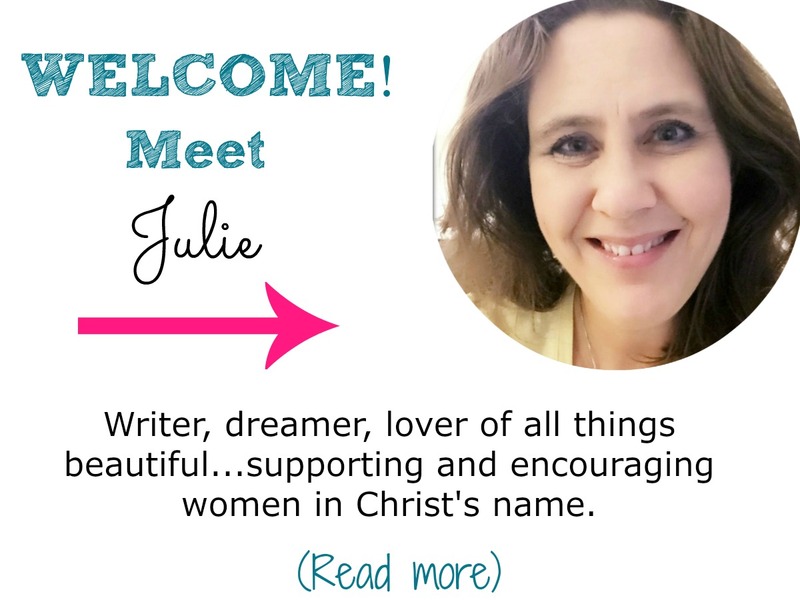 When I first began planning retreats, I had no idea what to charge. I just knew that I wanted to make each person’s experience the best I possibly could. Recently I shared with you 5 Tips to Stay on Budget for Your Retreat, and even as I was writing I kept thinking about the fact that it’s hard to know how to stay on budget if you don’t know what your budget is in the first place. This is where knowing what to charge can help you determine your budget and what you can afford to offer. What’s your starting budget? Even if it’s $0 which ours has been many times, you’ll be able to use the calculator to figure out a fair price for your attendees. Total your expenses to get a good idea of how much you’ll need to cover everything. You can make your retreat as fancy or as simple as you’d like. Find many frugal but meaningful resources here on the blog if you’re looking to keep costs down. Estimate how many attendees you’ll have. If you’ve never held a retreat, this might be hard to do. For our first retreat, we wanted 100 but knew we’d be happy with at least 10. In the end, we estimated 20 women would come and based our fee on that number. 35 women ended up attending our first retreat. That meant we under estimated and charged a little more than we needed to. However, we were able to use the extra income for scholarships to help women who couldn’t otherwise afford to come plus we were able to give more to the mission project we adopted for the retreat. Use the free budget and ‘what to charge’ calculator below to determine the minimum amount to charge. Take the guesswork out and plug your numbers in to the spreadsheet. Don’t forget to email me if you have any questions on how to use it! 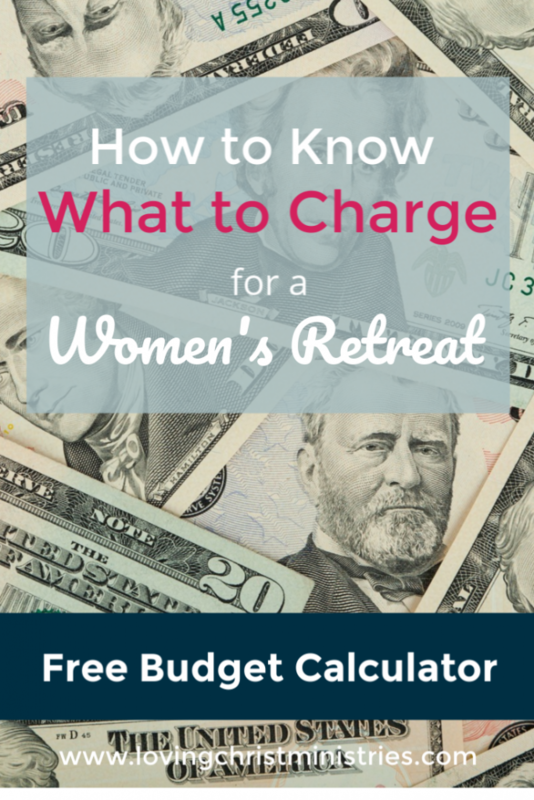 This Google Sheets spreadsheet can automatically calculate what to charge for your women’s retreat based on your starting budget (even if it’s $0! ), expenses, and estimated attendees. You’ll be able to enter your starting budget first. Then, you’ll fill in the amounts for your itemized expenses. Last, you’ll enter your expected number of attendees. Play around with this number to see different suggestions for what you should charge for your retreat. The spreadsheet will automatically calculate the expected minimum fee. As a bonus, I’ve added two extra tabs to your spreadsheet so that you can keep track of all transactions, income, and expenses. 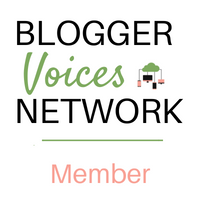 *Click the link below to open the ‘what to charge’ spreadsheet. *Sign into your Google account if needed. *Click the Make a Copy button. 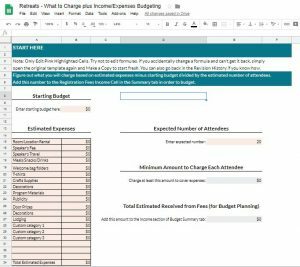 Begin with the first tab, “What to Charge”, to figure out the minimum amount you need to charge each attendee. Once you have the amount, you can add it to the Budget tab under Income/Registration Fees and continue working on your retreat budget. Be sure to let me know any questions you have! Want to remember this? 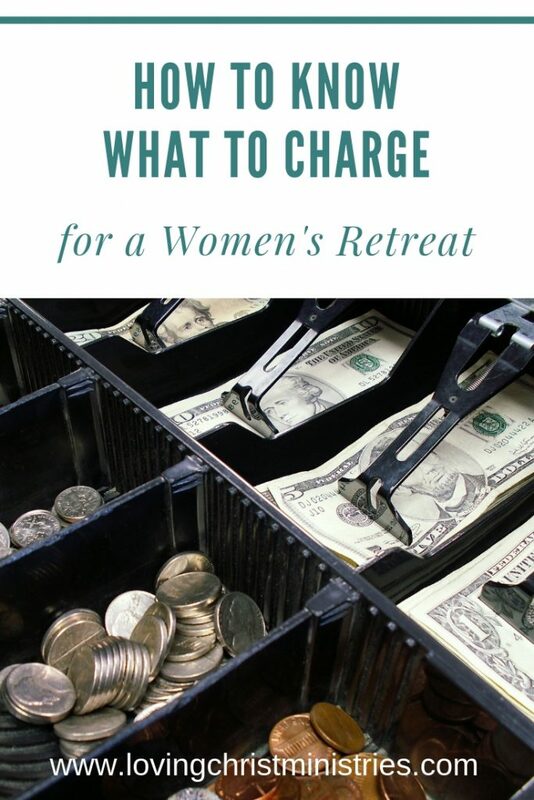 Post this What to Charge for a Women’s Retreat article to your favorite Pinterest board!